On Friday, jurors weighing the case of Darlene Marie Green returned with a verdict of guilt on the charge of manslaughter. We had a story, in case you missed it, chronicling the jury’s decision. 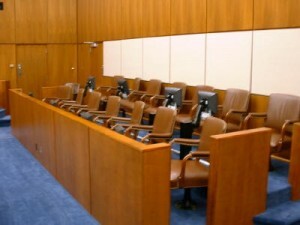 There was one juror in the case, though, that took to his Twitter account following the verdict. In fact, @adamoffburwell replied to my tweet of “The jury has reached a verdict in the case of Darlene Green,” with “yes we did,” and said he was juror No. 7. @Adamoffburwell posted several tweets about his experience serving on the jury, including: “I felt the jury did its job in the darlene green case and didnt take the easy road.” I’ll let you see the rest for yourself. 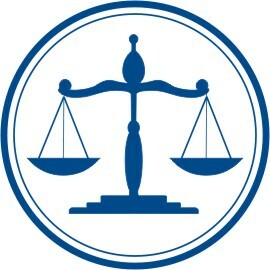 May 7, 2012 In the Courts, Social Media and the CourtsDarlene Marie Green, Twitter Inc. Jurors! Focus on the Courtroom! A new marketing campaign is underway in our courts. But you won’t likely see it unless you A) read this blog or B) get called for jury duty. The campaign comes in response to our nation’s embrace of social media in all facets of life. The courts, always lethargic in keeping up with the times, have only begun to channel juror social media behavior so as to preserve the integrity and impartiality of the jury. Here’s the latest by way of our own courts in Washington: a poster. Recent headlines point to a new concern for courts: “Judge to Juror: Stop tweeting about the murder trial”; “Jurors ‘friending’ each other on Facebook” and “Googling juror prompts court to overturn jury verdict”. In the age of social media, with smart phones at our fingertips every day, sharing a ‘status update’ on the experience of serving as a juror may be the instinctive response. 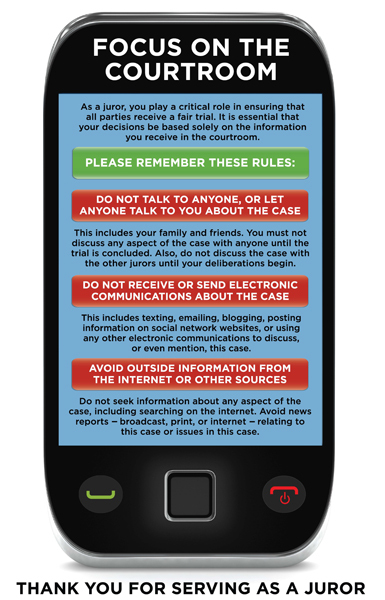 Starting this month, jurors in Washington courtrooms will see a new poster designed to remind jurors of their critical role in assuring a fair trial — and the importance of refraining from researching a case online or commenting on social media sites while the trial is ongoing. “We recognize that, in their normal 21st century lives, jurors may routinely post information about all of their activities on websites and are probably accustomed to using the internet to get quick answers to any question that might arise,” said King County Superior Court Judge William Downing Co-Chair of the Washington State Pattern Jury Instructions Committee. This is a critical point. The U.S. Constitution requires impartial juries, meaning that jurors must be unbiased, must refrain from prematurely forming or discussing opinions about the case, and must base their decisions solely on the information received in the courtroom. 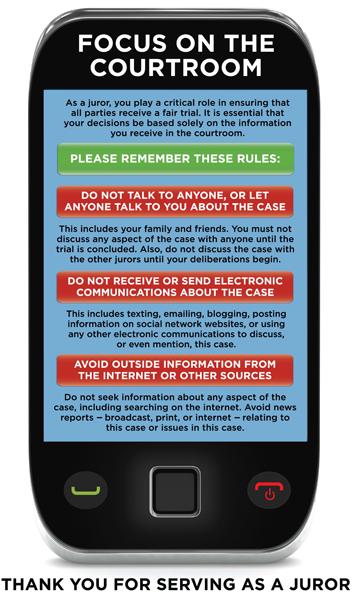 The poster cautions jurors to avoid outside information about the case from the internet or other sources, and not to text, e-mail, blog, or discuss the case with family or friends. The poster was created by the Washington Pattern Jury Instructions Committee, with private funds at no cost to taxpayers. So, there you have it. Any thoughts on the poster? Surprise, surprise: The wealth of information many of us post about our lives on social media sites is being eyed by lawyers. Last fall during jury selection in a murder case in Kitsap County Superior Court, prosecutors asked the potential triers-of-fact if they regularly “blogged” at newspaper web sites. The motivation by the state’s lawyers was to analyze their points of view to see if they could be impartial jurors. Fast forward to this year in Maryland, where prosecutors argued successfully to redact juror candidates’ names prior to trial, to keep defense attorneys from Googling them before trial, according to a story in the Baltimore Sun. The judge signed off on the request. It goes without saying that the more we participate in social media sites like Facebook and Twitter, the more of our lives become transparent. They create records of our interactions, our ideas and our beliefs. Police regularly Google suspects’ names during law enforcement investigations. So do we in the media world for the stories we write. I’d guess most people have conducted an Internet search or two (or many) to learn more about others. So it is without surprise that our nation’s legal minds are also mining the Internet. Any information that could give them an edge — from finding evidence on Facebook that supports their case to rooting out a juror that shows his bias commenting on news stories — is fair game. Will there be courtroom rules to officiate such searching? So far, our judicial system, which moves far slower than technology, hasn’t caught up. September 25, 2011 In the Courts, Social Media and the CourtsBaltimore Sun, Facebook, Google Inc., jury selection, Kitsap County Superior Court, law enforcement investigations, Maryland, newspaper web sites, Online social networking, social media in the courts, social media sites, Twitter Inc.